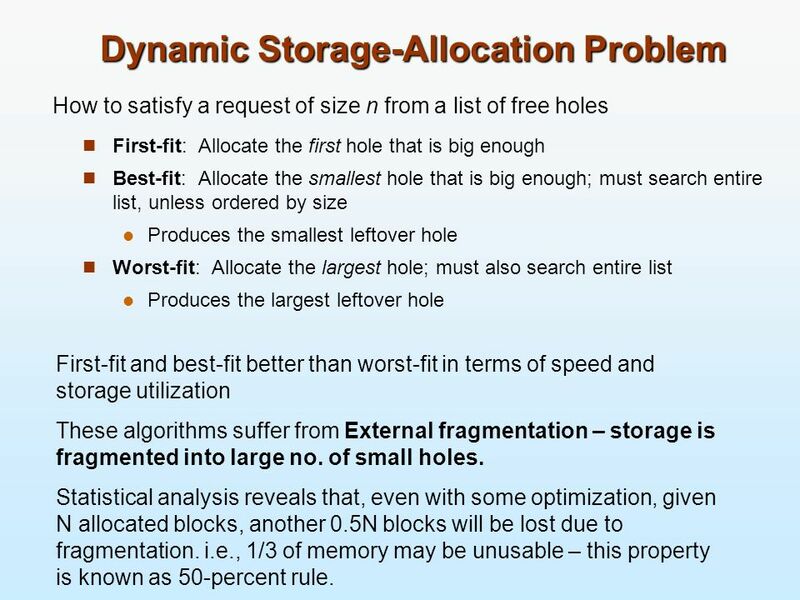 How to satisfy a request of size n from a list of free holes First-fit: Allocate the first hole that is big enough Best-fit: Allocate the smallest hole that is big enough; must search entire list, unless ordered by size Produces the smallest leftover hole Worst-fit: Allocate the largest hole; must also search entire list Produces the largest leftover hole First-fit and best-fit better than worst-fit in terms of speed and storage utilization These algorithms suffer from External fragmentation – storage is fragmented into large no. 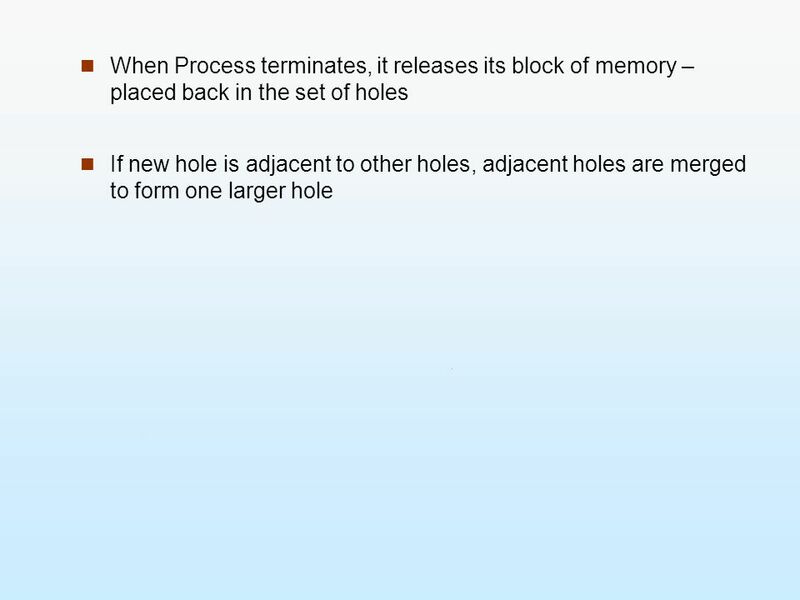 of small holes. 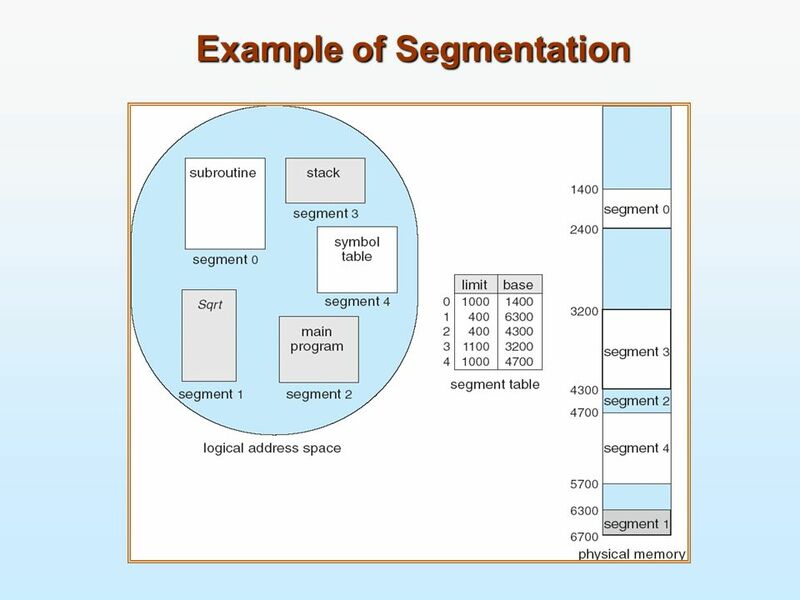 Statistical analysis reveals that, even with some optimization, given N allocated blocks, another 0.5N blocks will be lost due to fragmentation. 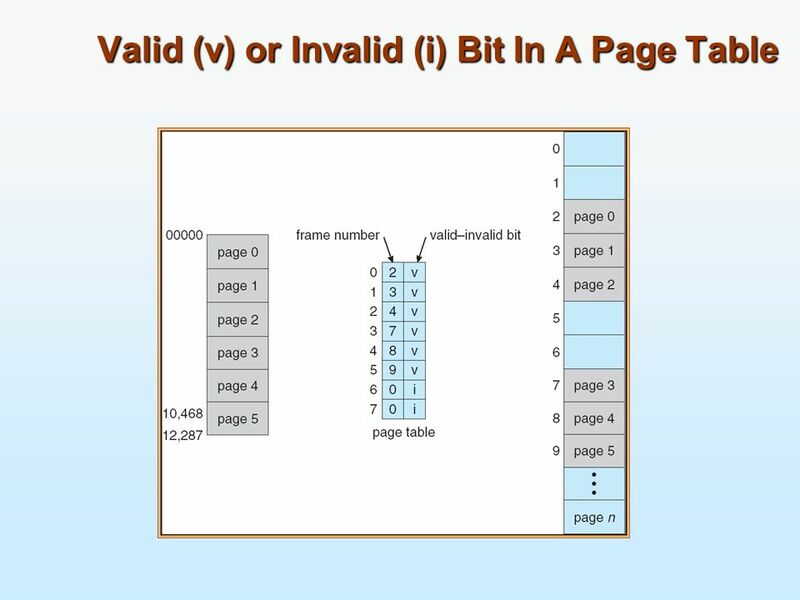 i.e., 1/3 of memory may be unusable – this property is known as 50-percent rule. 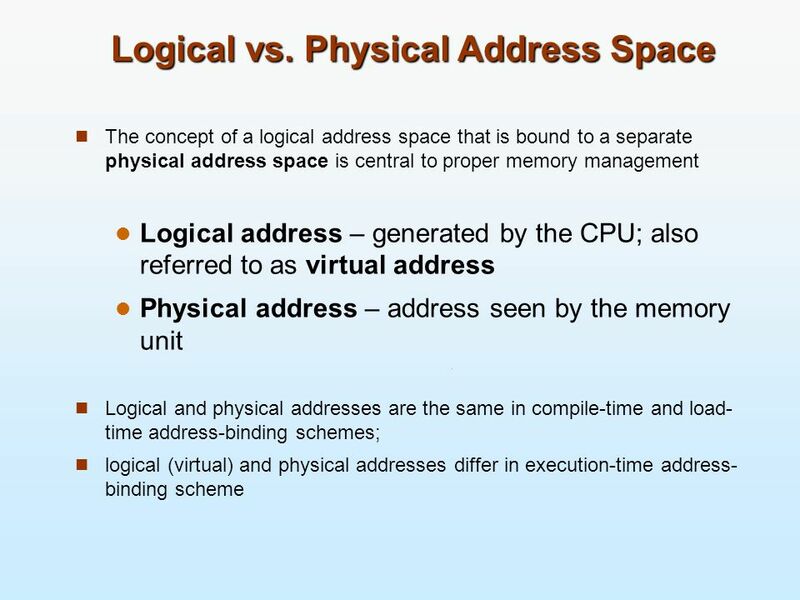 - permit the logical address space of a process to be non-contiguous, thus allowing a process to be allocated physical memory wherever available. 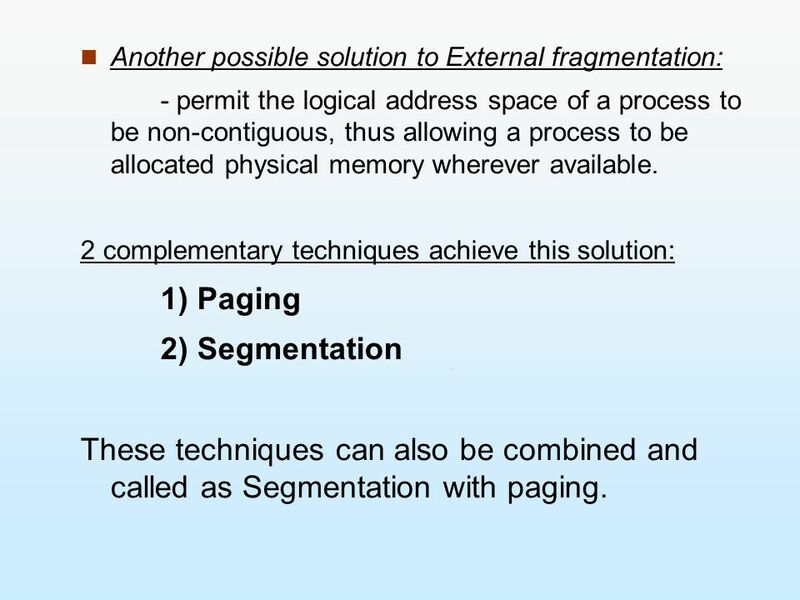 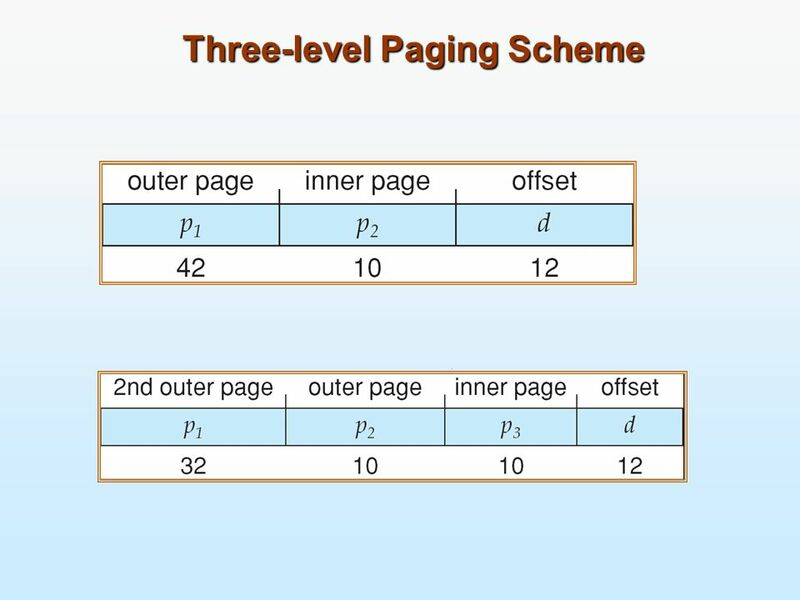 2 complementary techniques achieve this solution: 1) Paging 2) Segmentation These techniques can also be combined and called as Segmentation with paging. 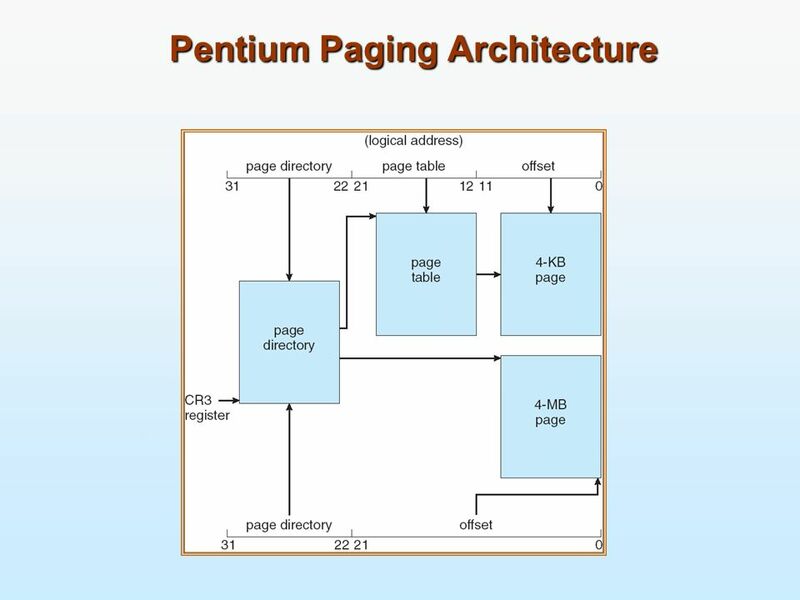 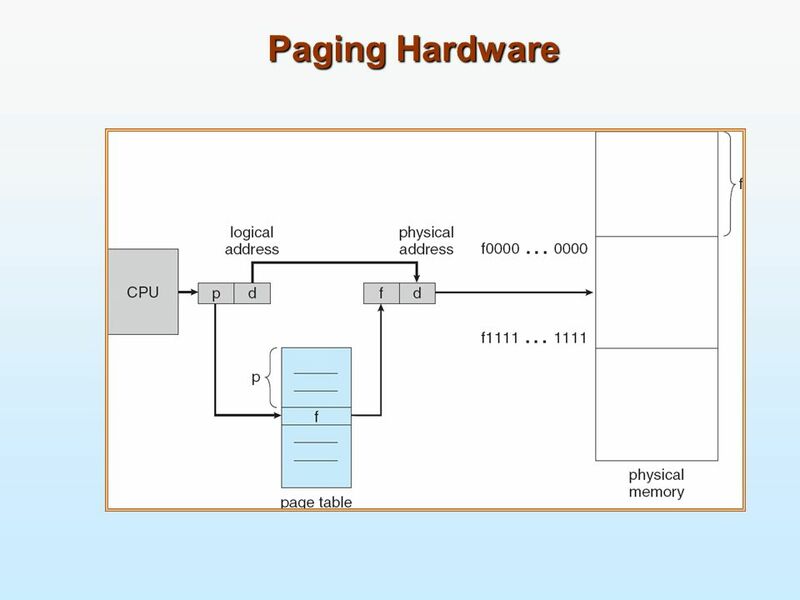 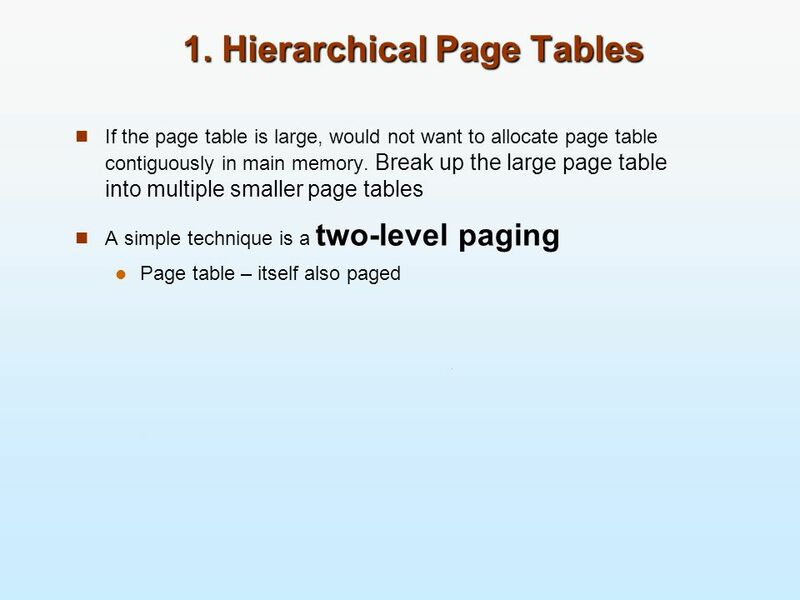 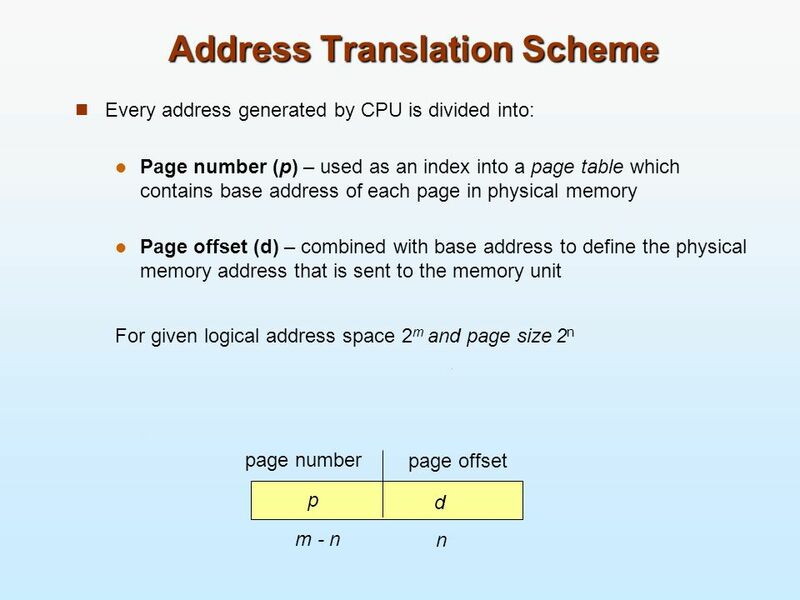 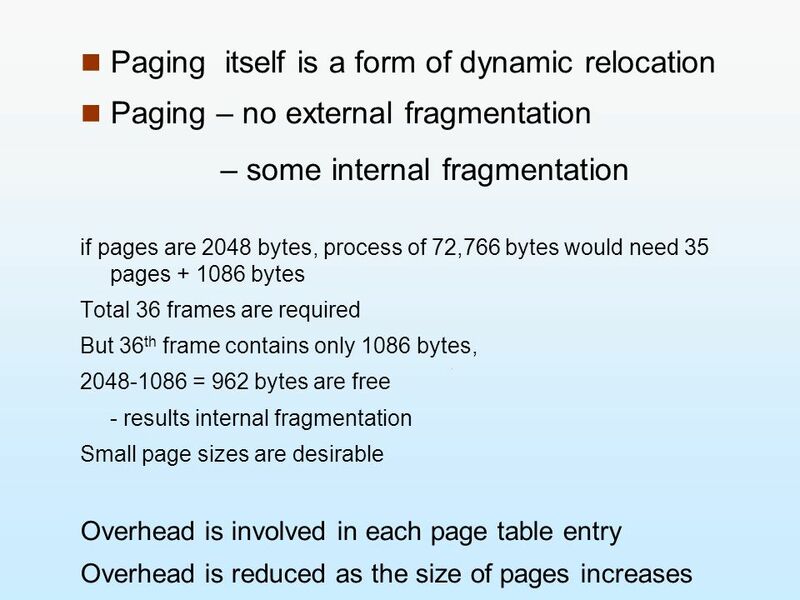 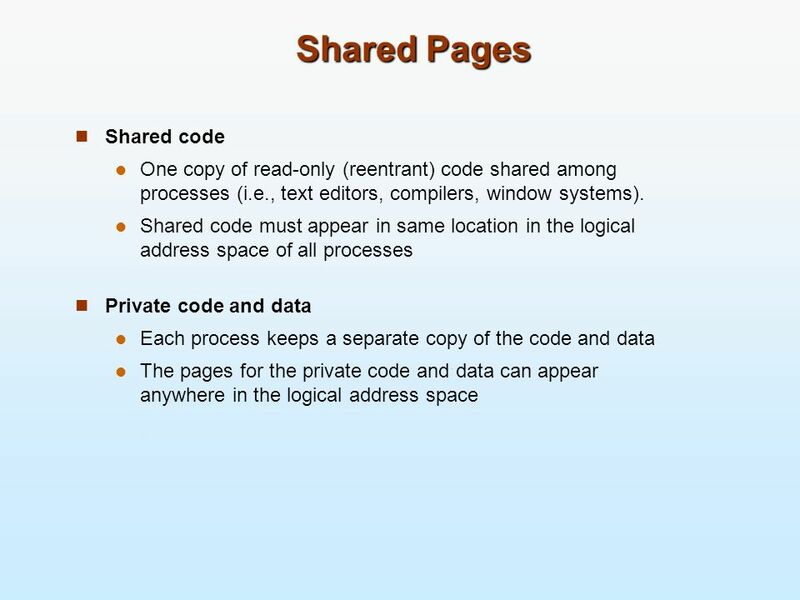 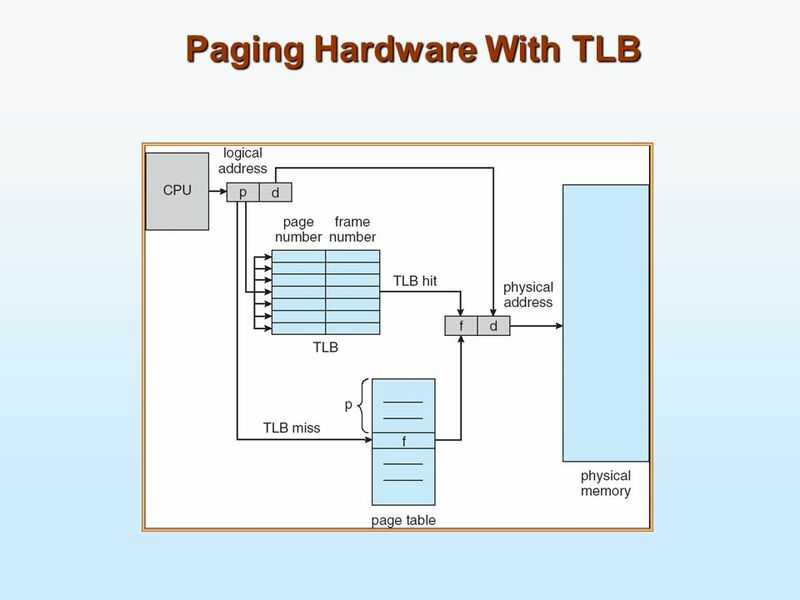 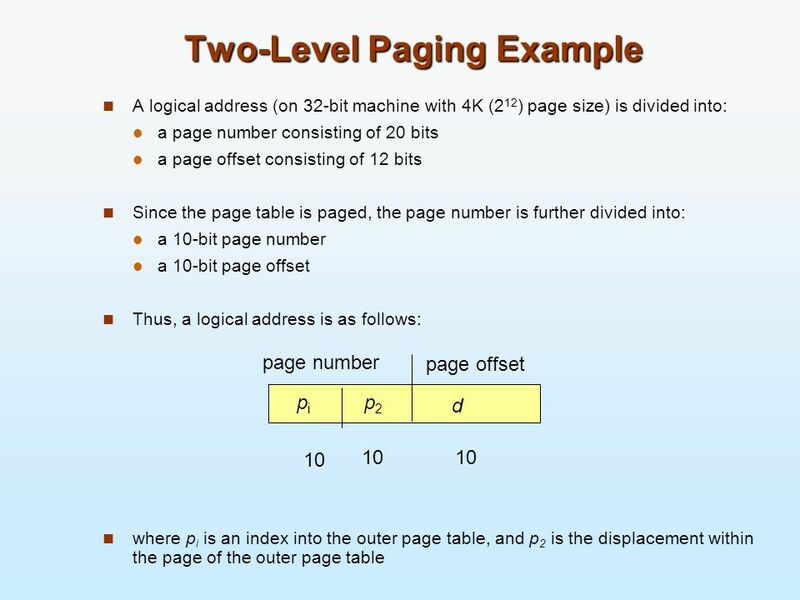 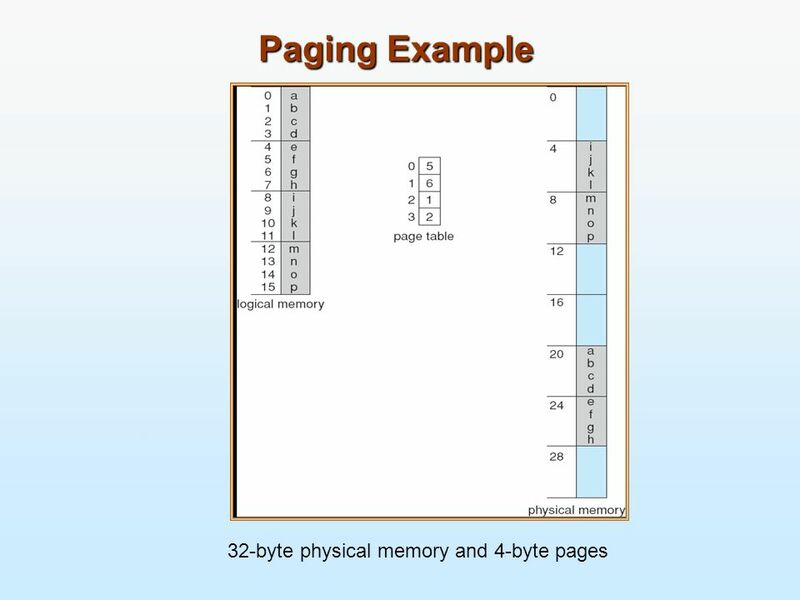 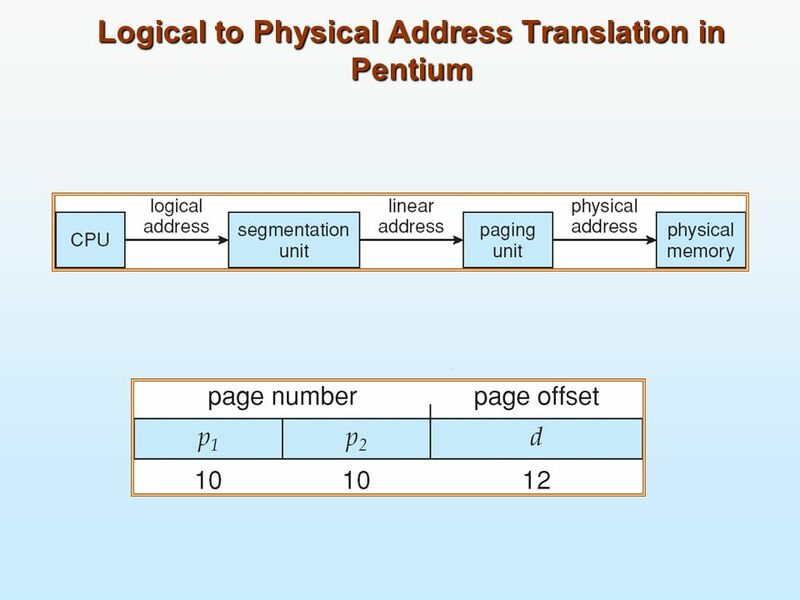 27 Paging Memory management scheme that permits the physical address space of a process to be non-contiguous Commonly used in most OS Handled by hardware Divide physical memory into fixed-sized blocks called frames (size is power of 2, between 512 bytes and 8,192 bytes) Divide logical memory into blocks of same size called pages Page size ( like frame size) is defined by the hardware Size of the page in powers of 2 makes the translation of logical address into page number and page offset particularly easy. 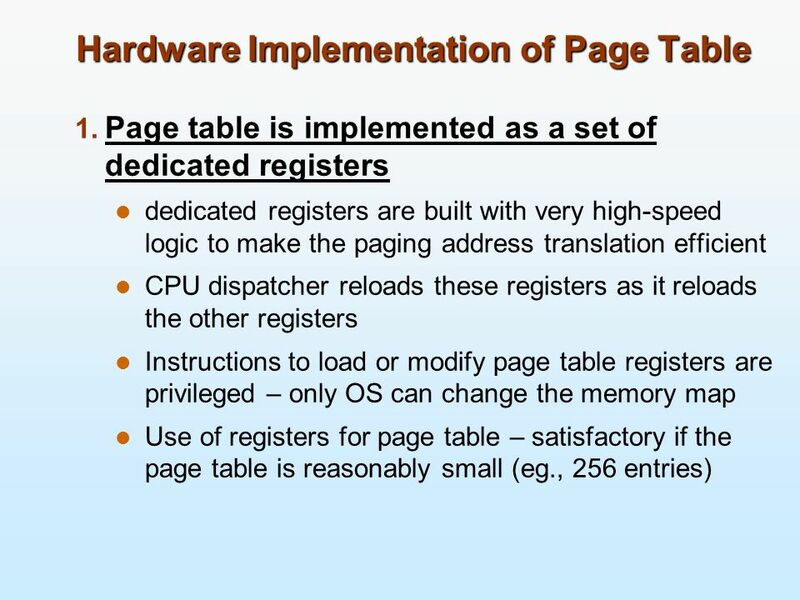 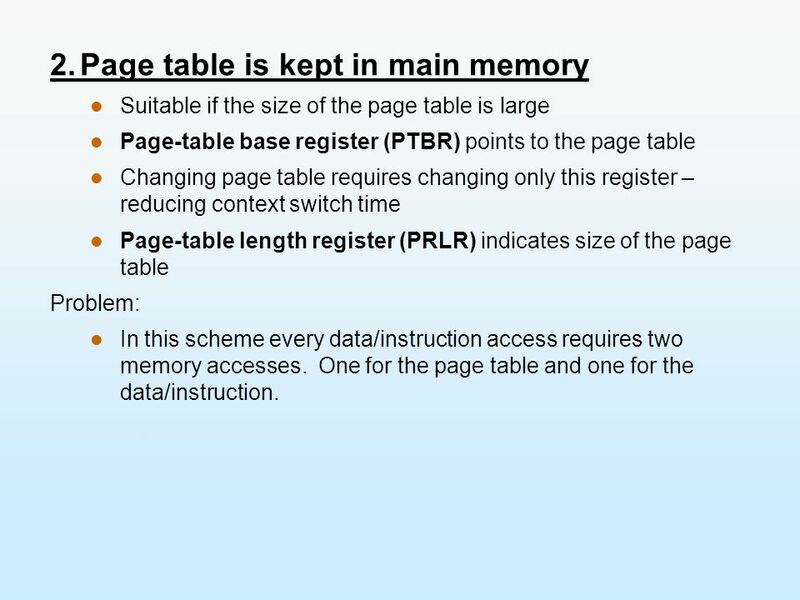 Suitable if the size of the page table is large Page-table base register (PTBR) points to the page table Changing page table requires changing only this register – reducing context switch time Page-table length register (PRLR) indicates size of the page table Problem: In this scheme every data/instruction access requires two memory accesses. 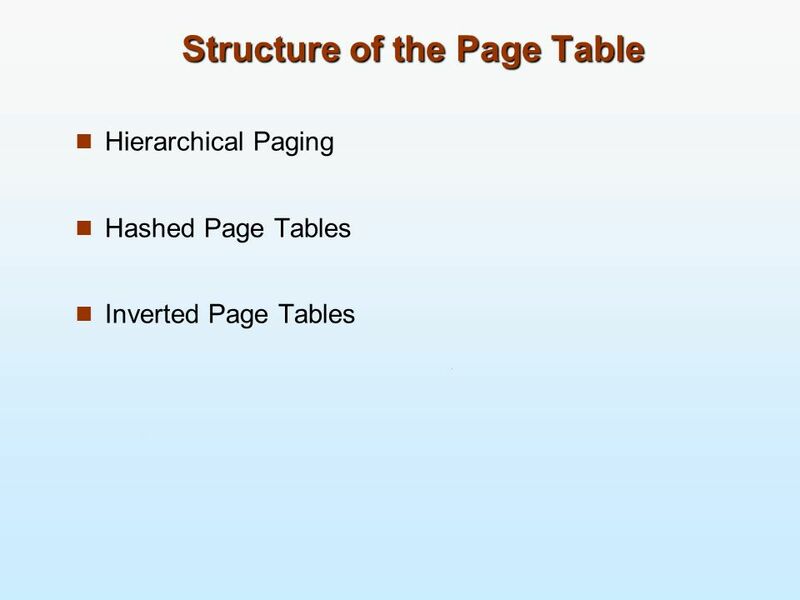 One for the page table and one for the data/instruction. 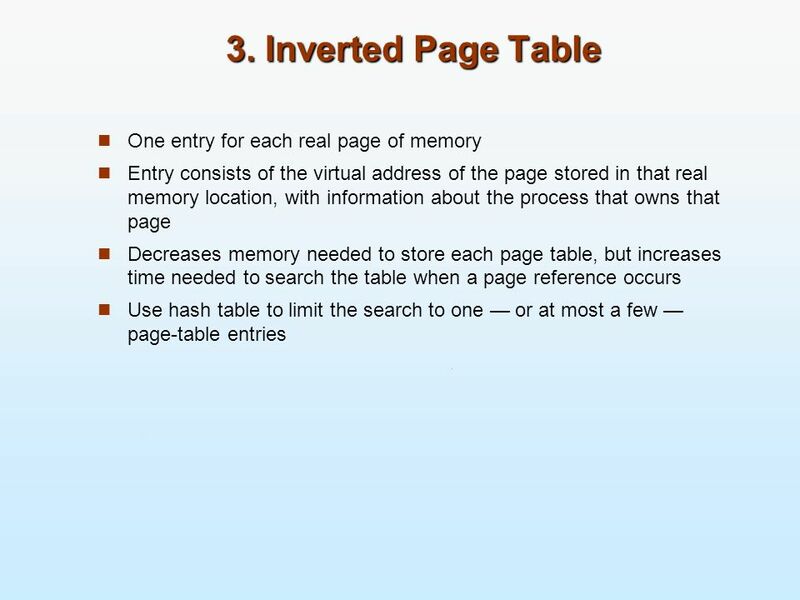 The virtual page number is hashed into a page table. 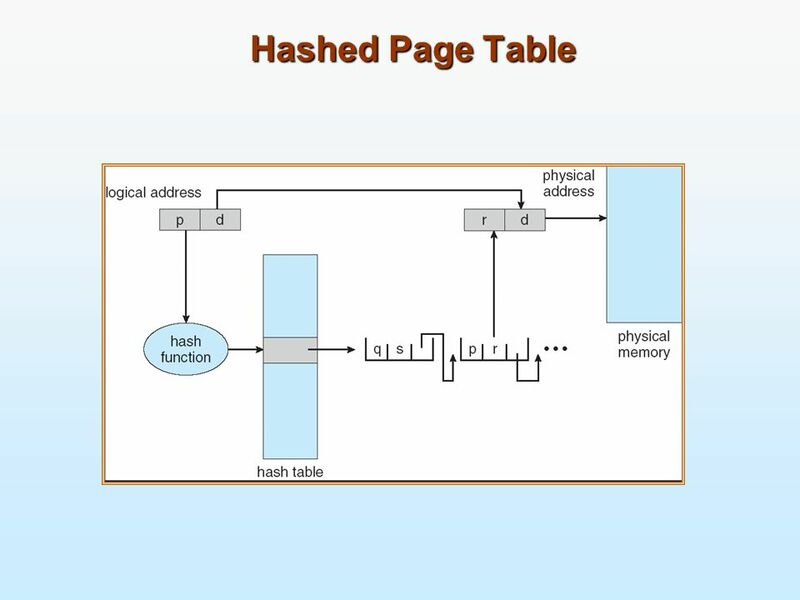 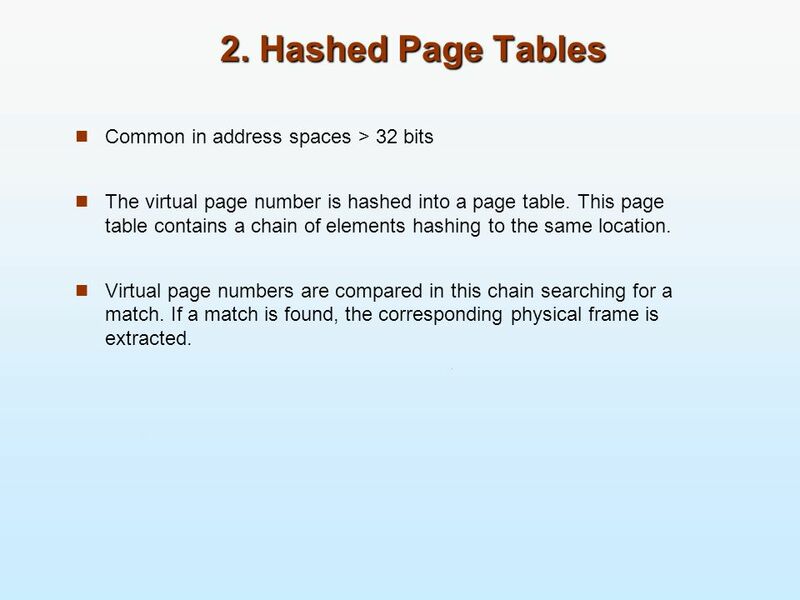 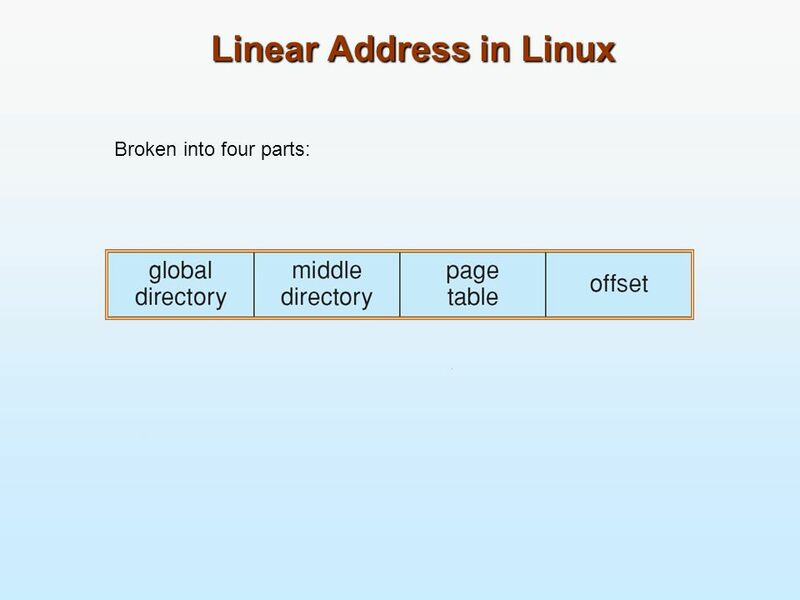 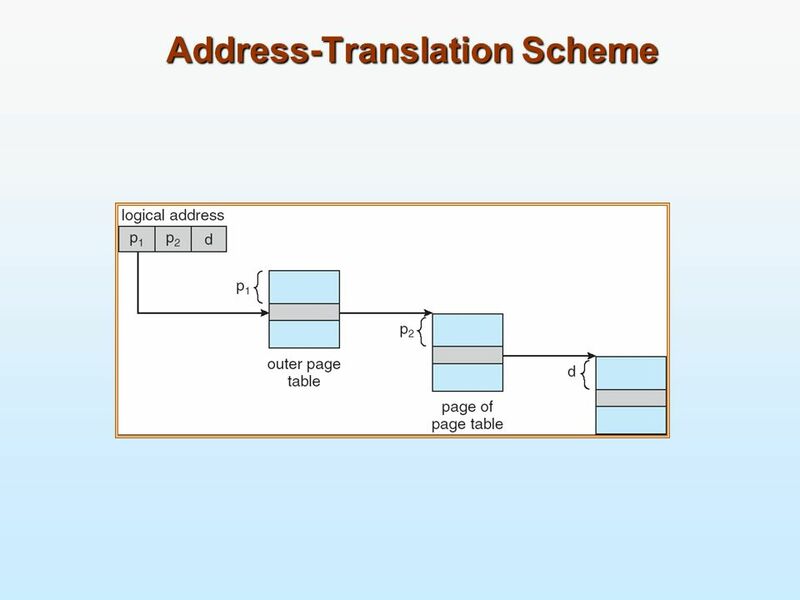 This page table contains a chain of elements hashing to the same location. 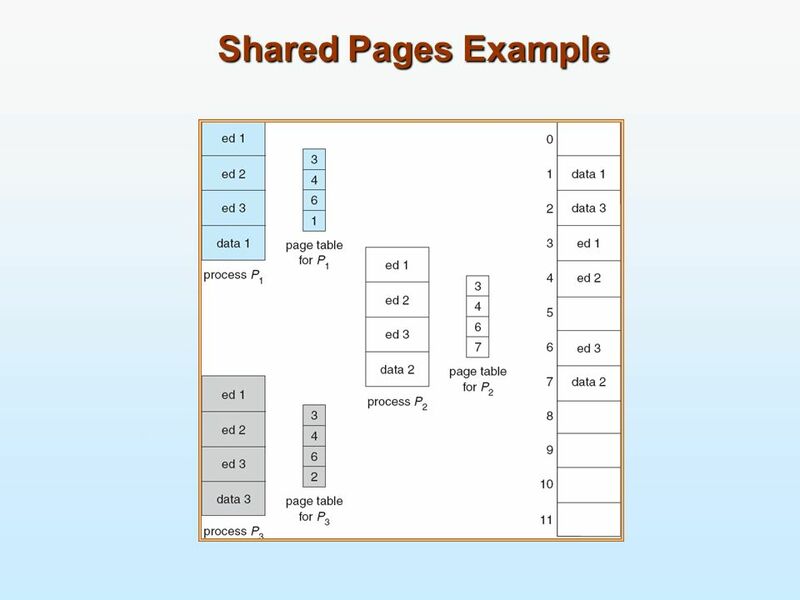 Virtual page numbers are compared in this chain searching for a match. 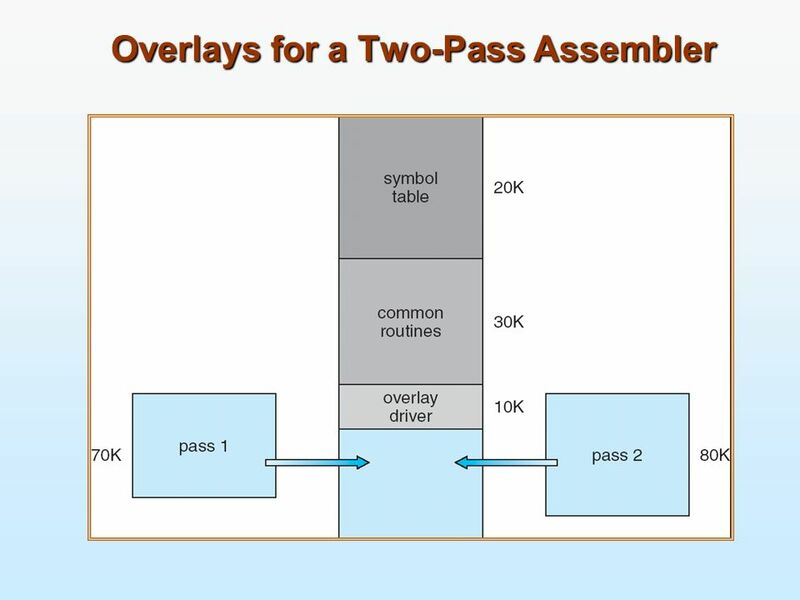 If a match is found, the corresponding physical frame is extracted. 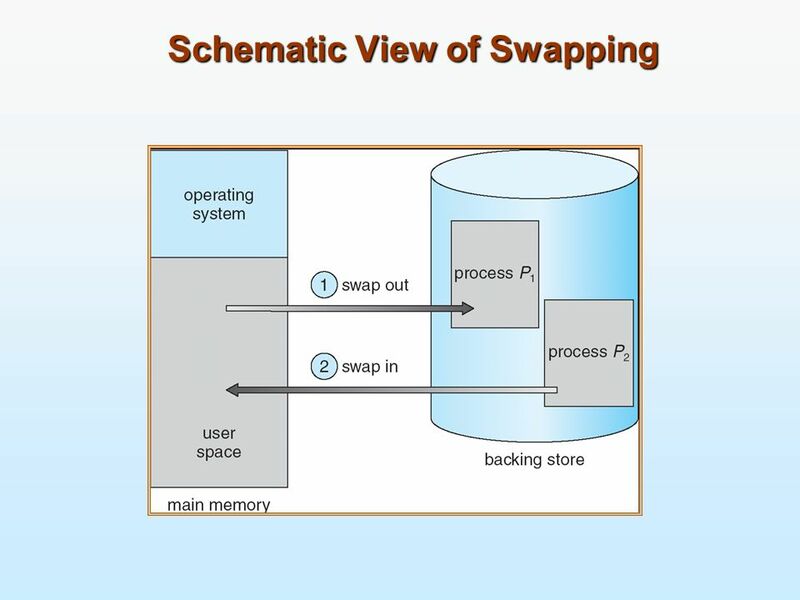 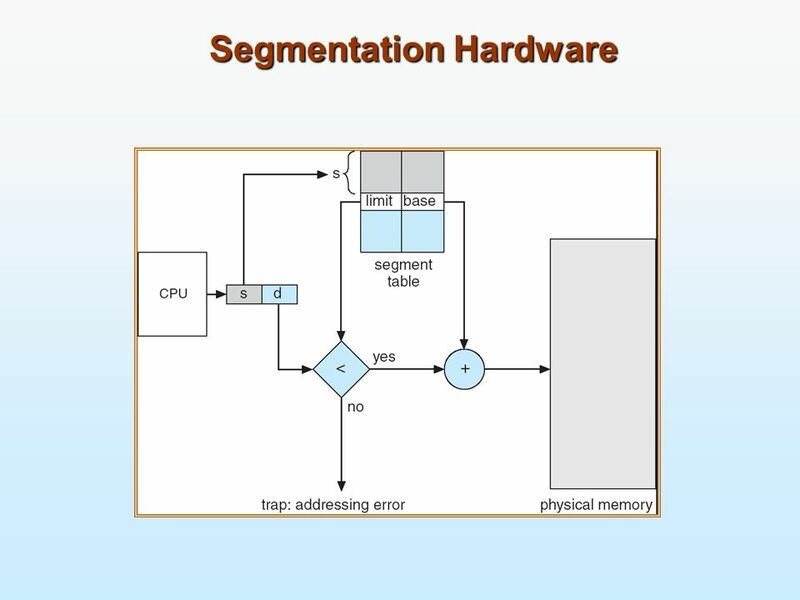 Download ppt "Memory Management Background Swapping Contiguous Memory Allocation"
Silberschatz, Galvin and Gagne  Operating System Concepts Chapter 9: Memory Management Background Swapping Contiguous Allocation Paging Segmentation. 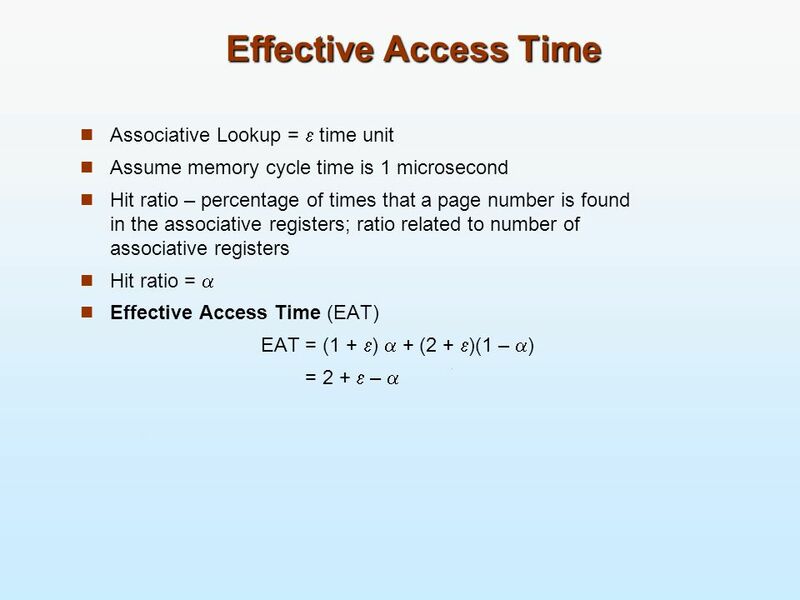 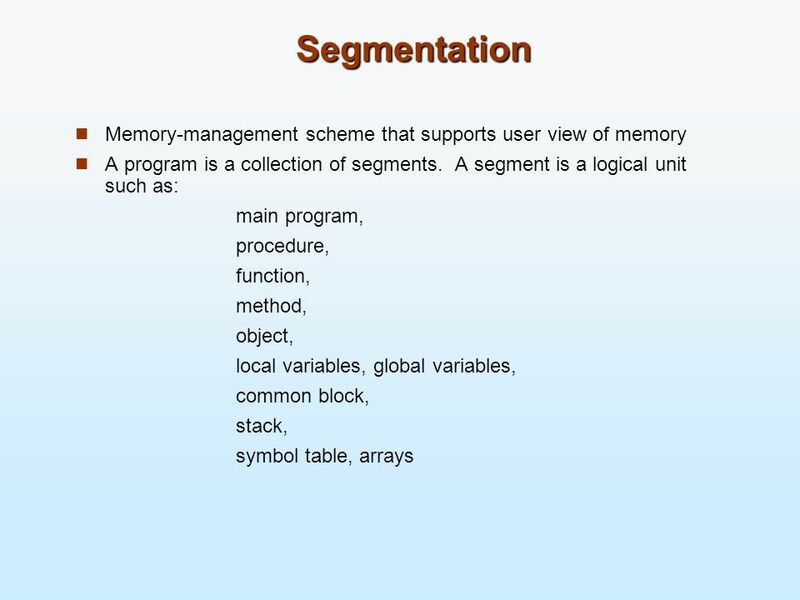 Main Memory CS Memory Management1. 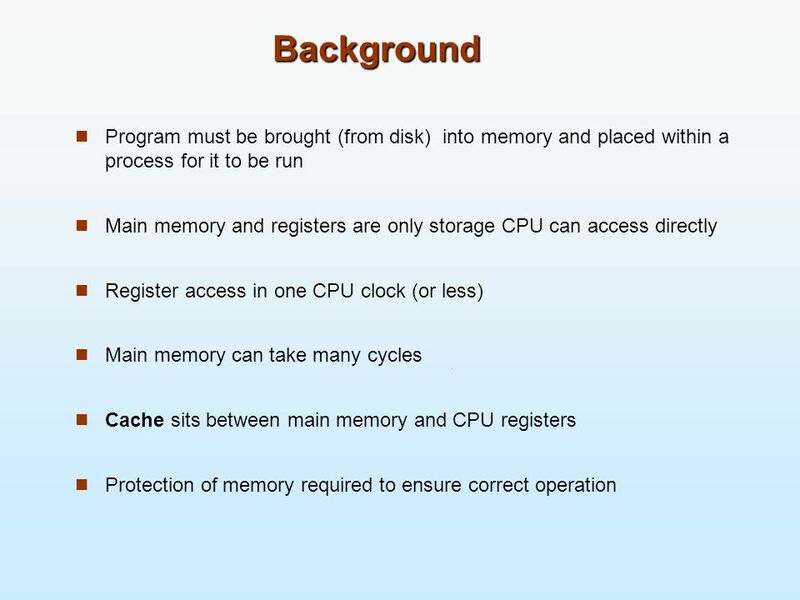 Background Program must be brought (from disk) into memory and placed within a process for it to be run Main. 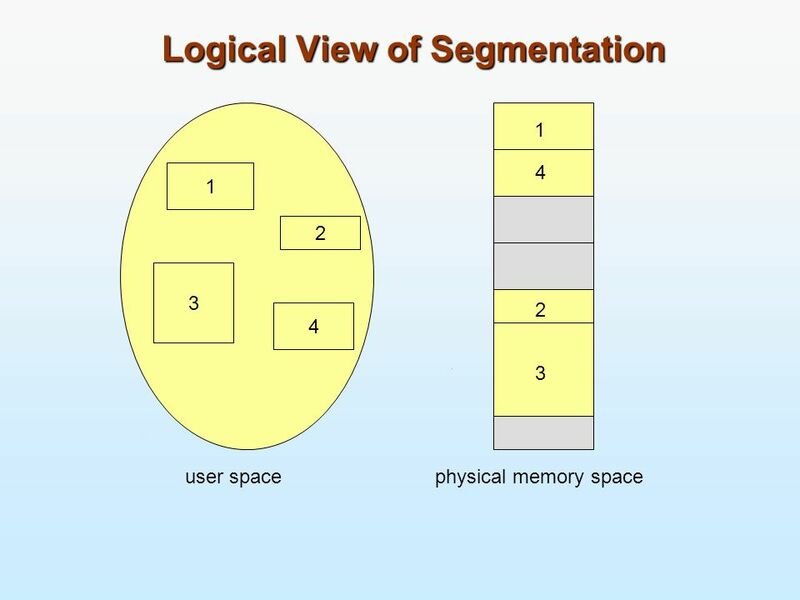 Modified from Silberschatz, Galvin and Gagne Lecture 16 Chapter 8: Main Memory. 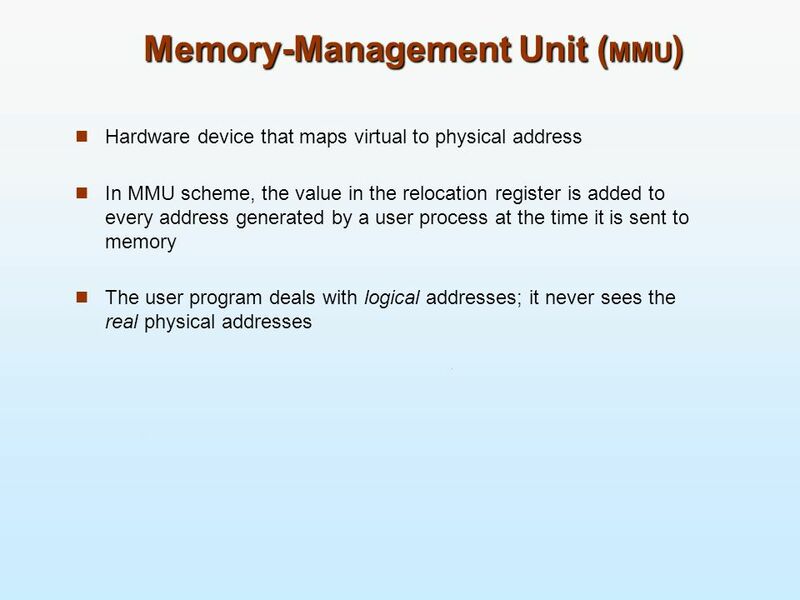 Chapter 9: Main Memory. 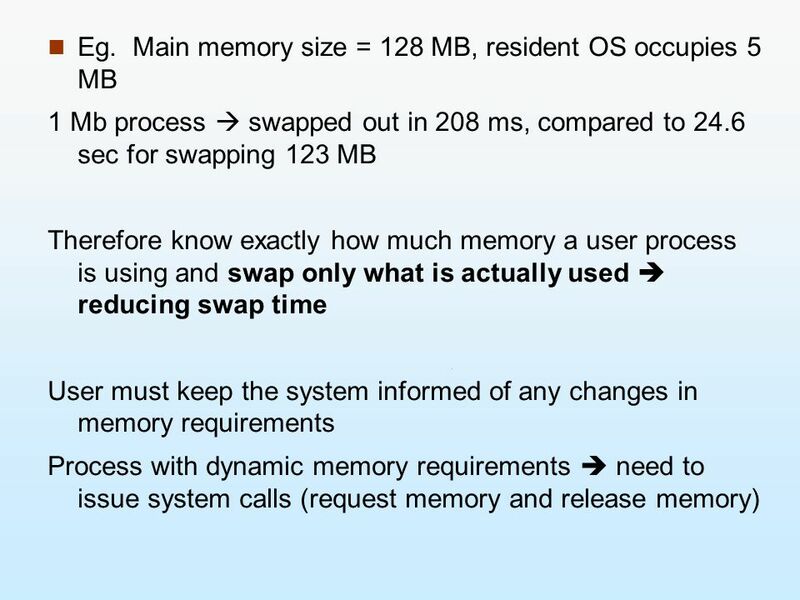 8.2 Silberschatz, Galvin and Gagne ©2005 Operating System Concepts – 7 th Edition, Feb 22, 2005 Chapter 9: Memory Management Background. 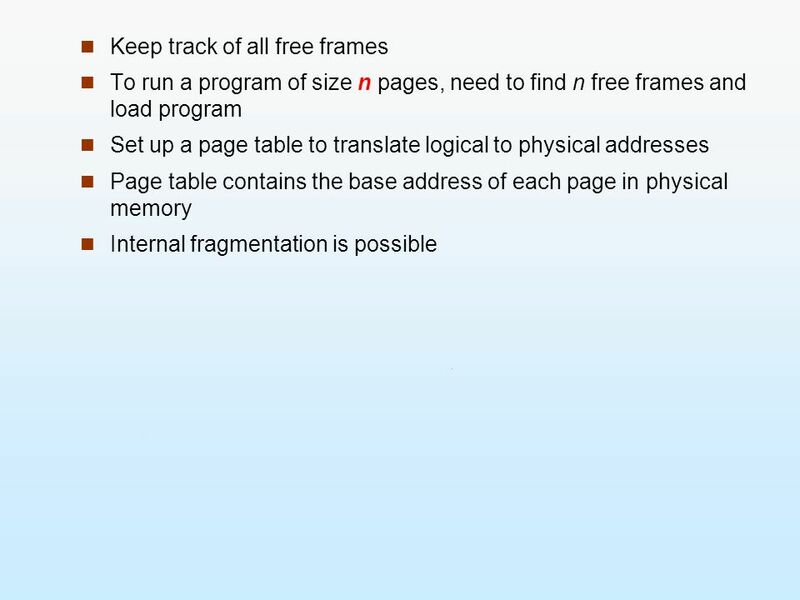 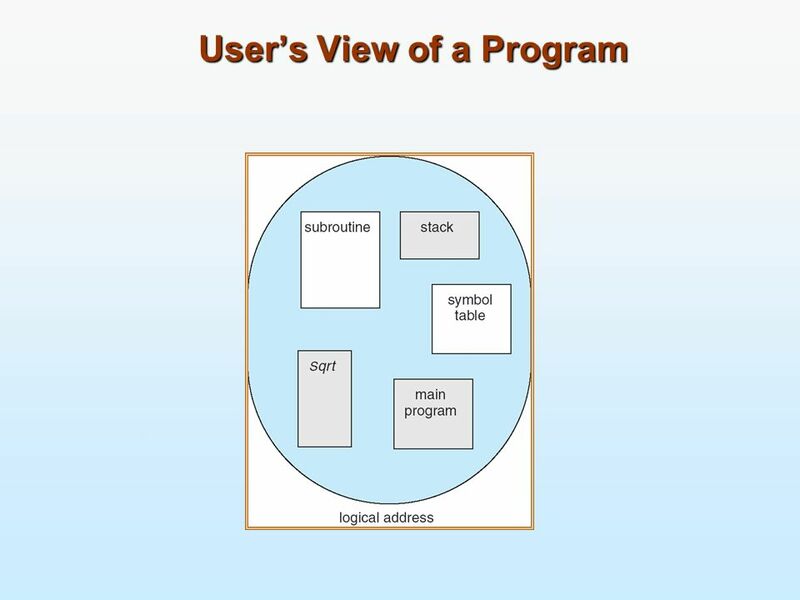 Background A program must be brought into memory and placed within a process for it to be executed. 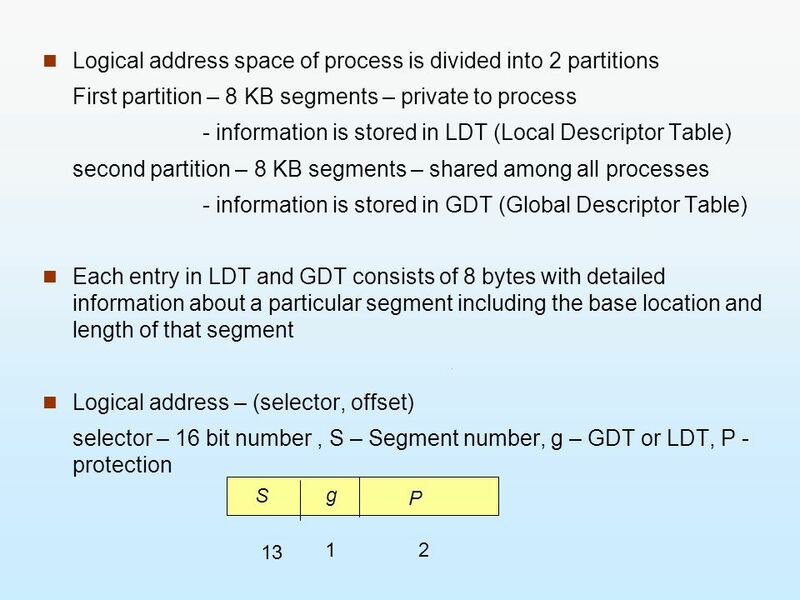 Input queue – collection of processes on the disk that. 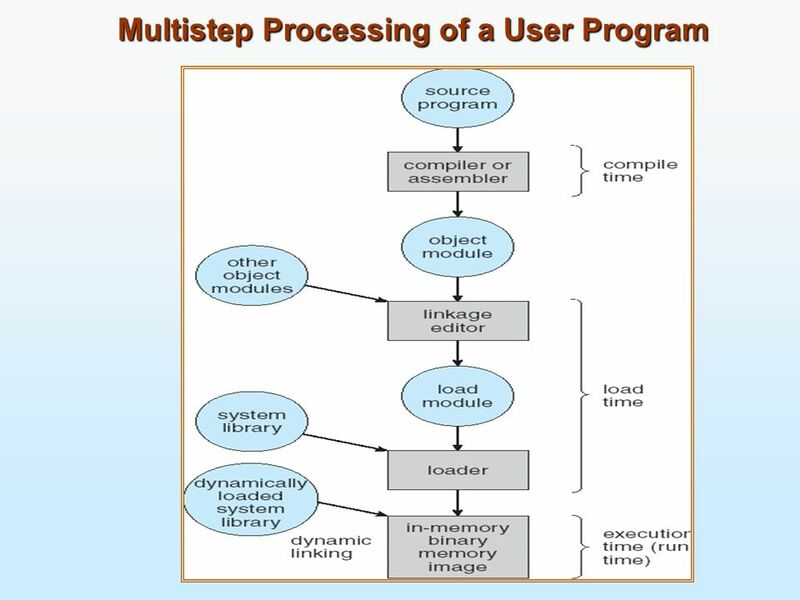 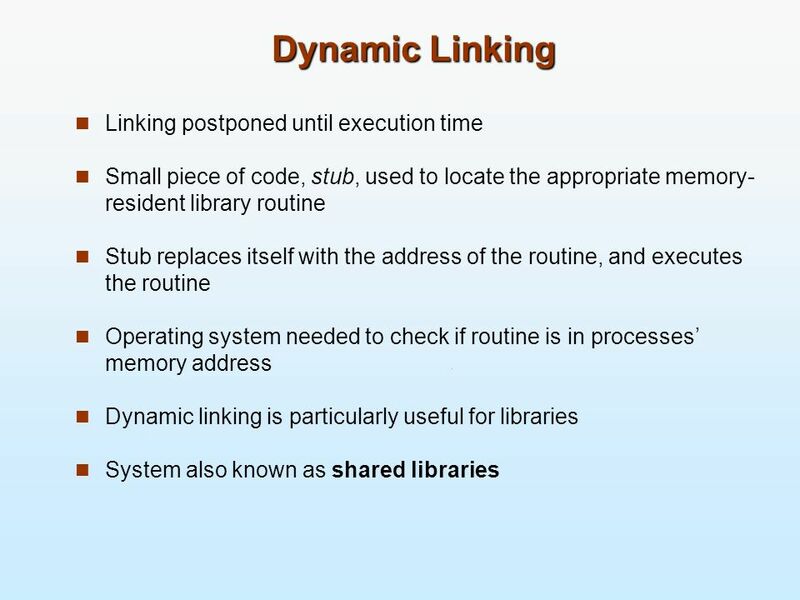 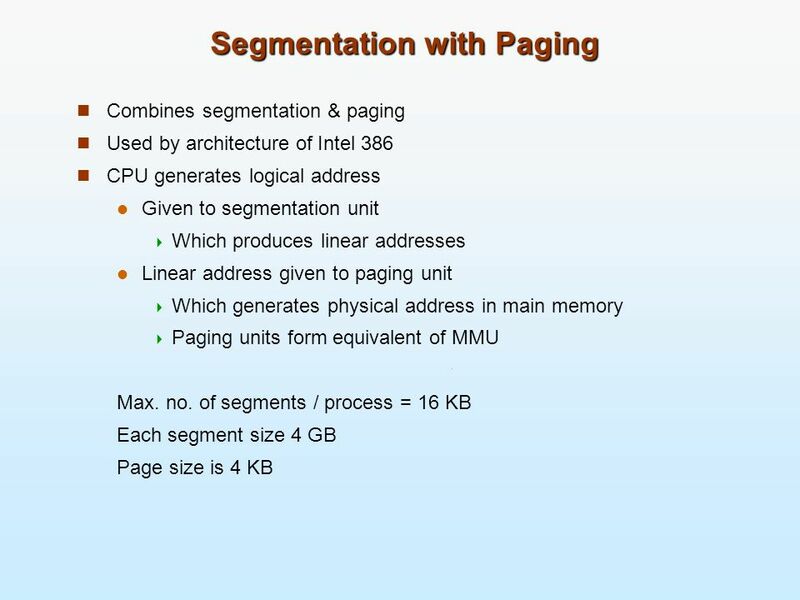 03/10/2004CSCI 315 Operating Systems Design1 Memory Management Notice: The slides for this lecture have been largely based on those accompanying the textbook. 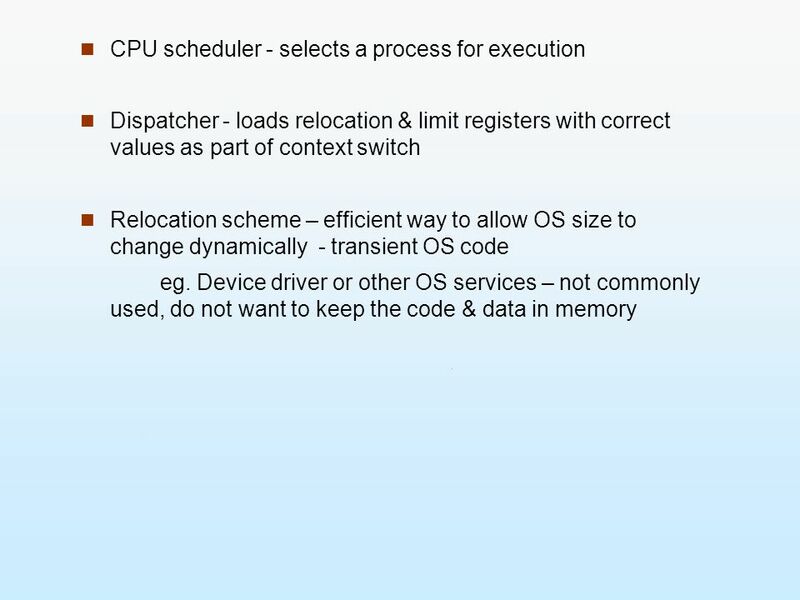 Silberschatz, Galvin and Gagne ©2009 Operating System Concepts – 8 th Edition, Chapter 8: Main Memory. 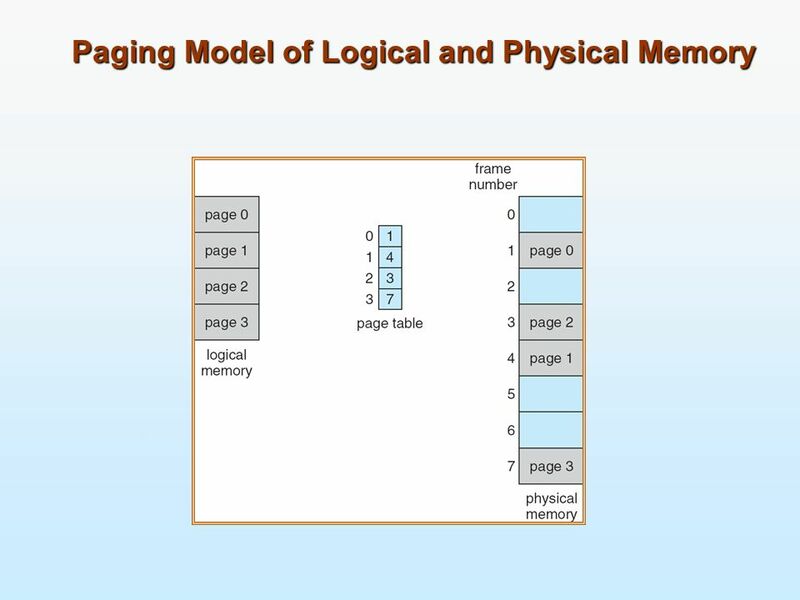 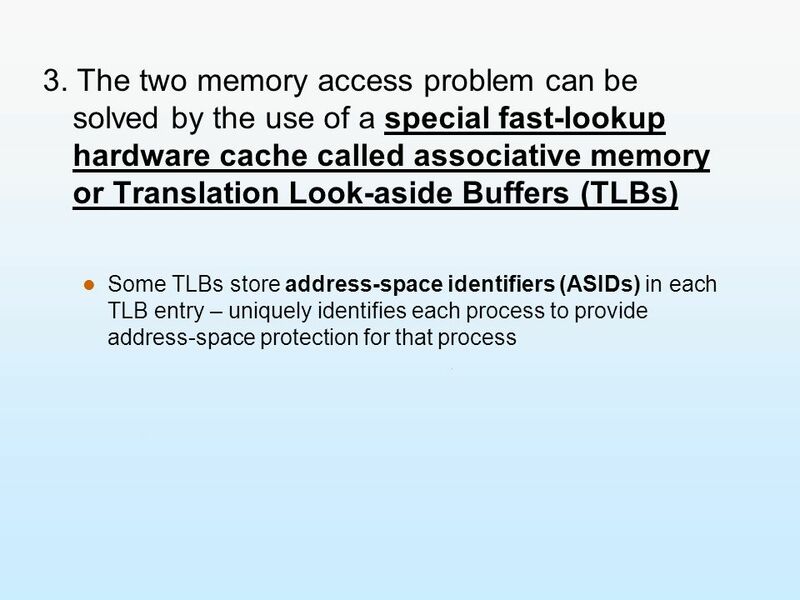 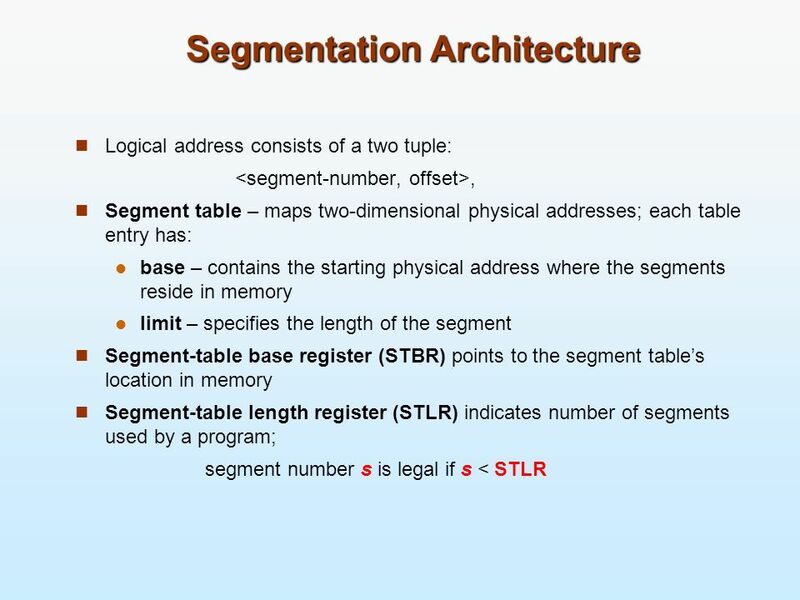 Memory Management Gordon College Stephen Brinton. 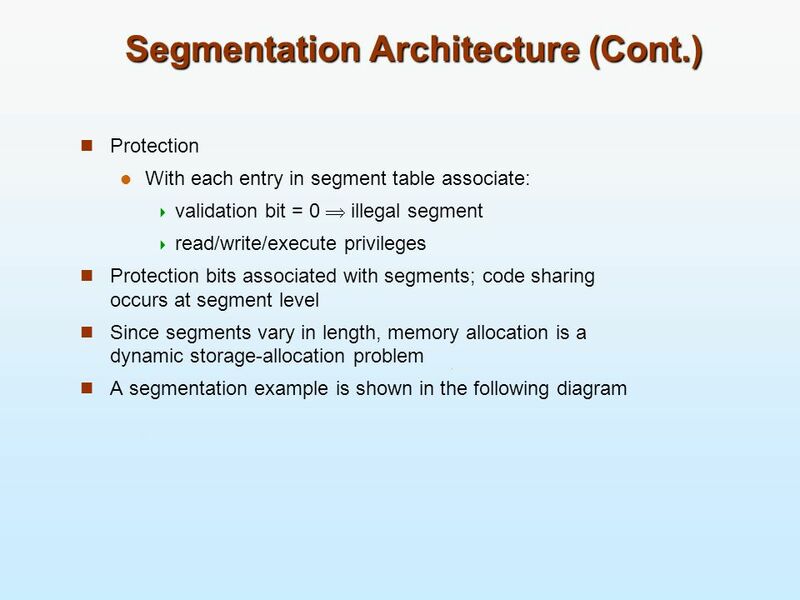 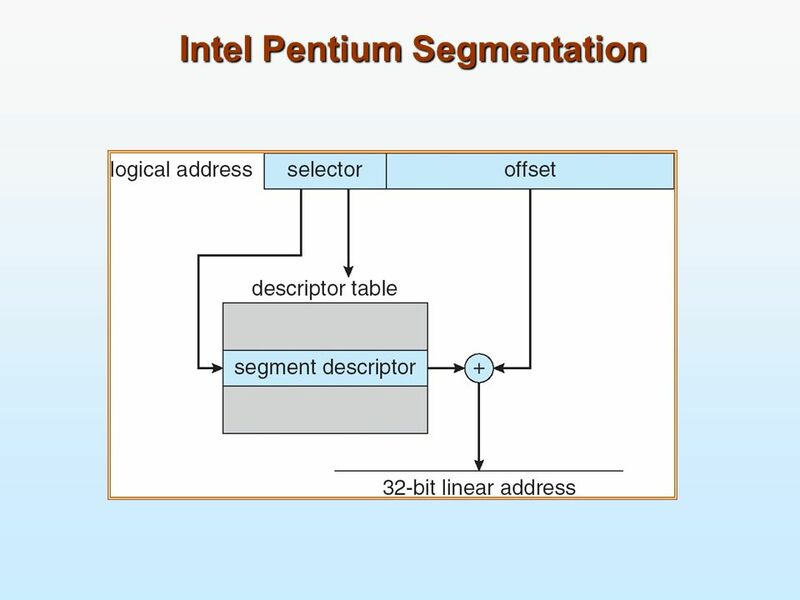 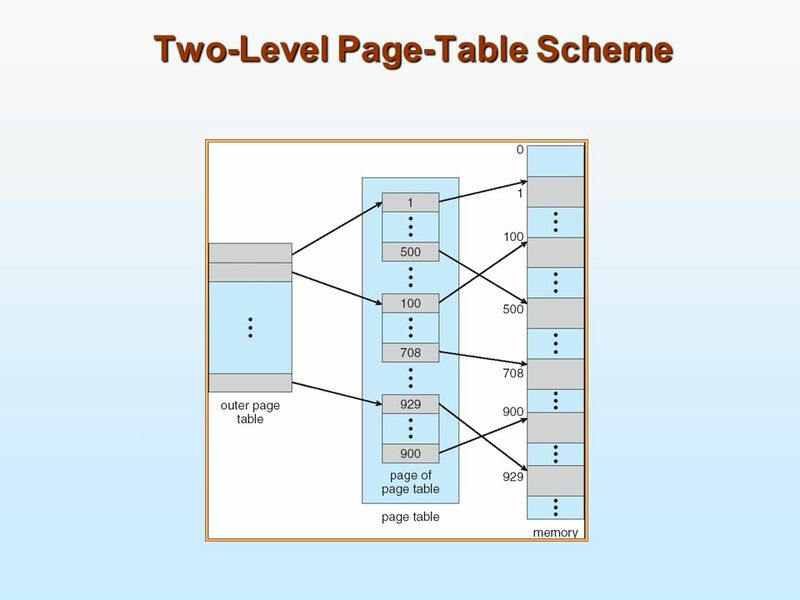 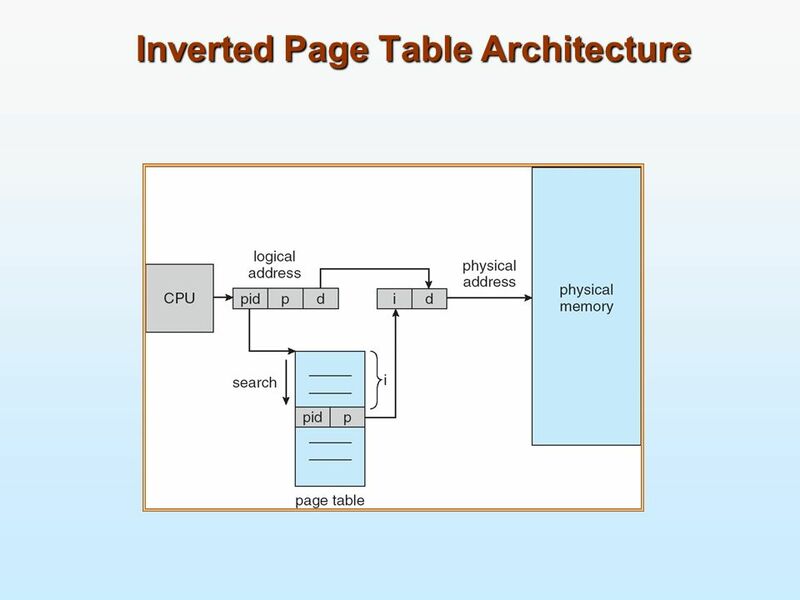 Chapter 7: Main Memory CS 170, Fall Memory Management Background Swapping Contiguous Memory Allocation Paging Structure of the Page Table Segmentation. 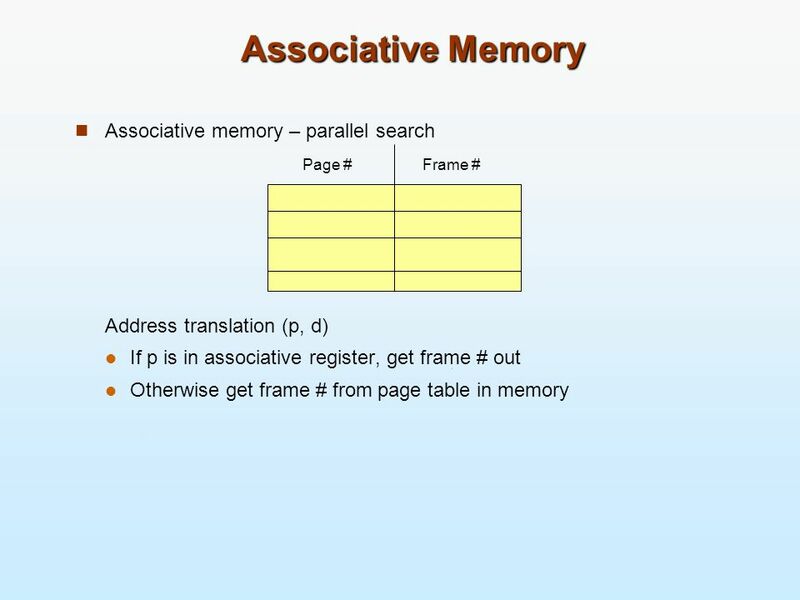 Main Memory. 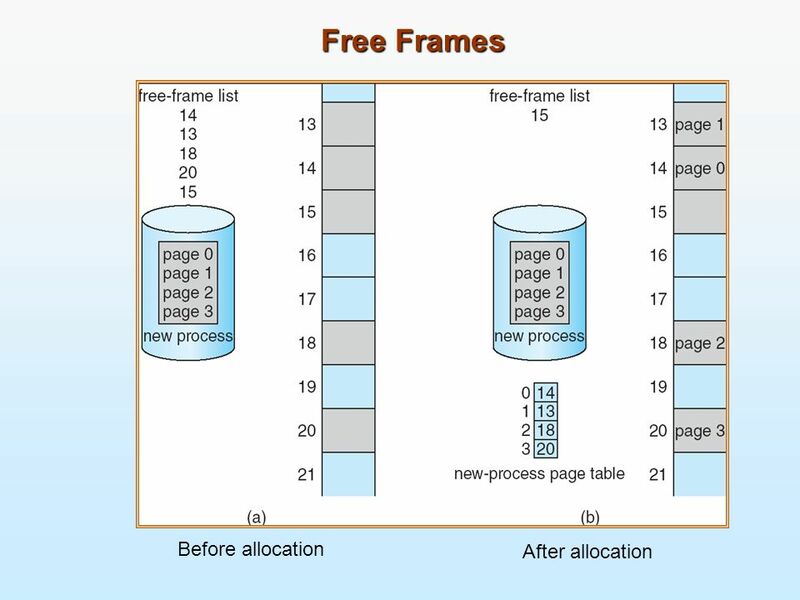 Background Program must be brought (from disk) into memory and placed within a process for it to be run Main memory and registers are only. 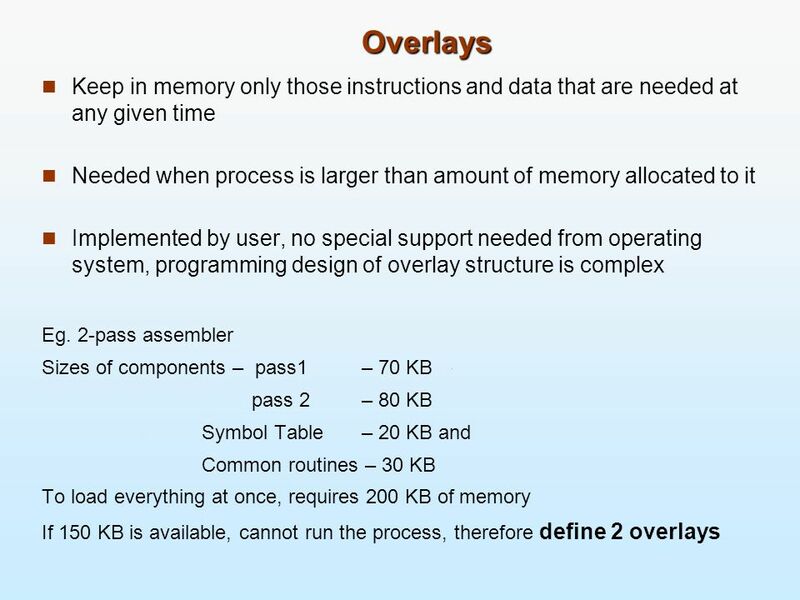 03/17/2008CSCI 315 Operating Systems Design1 Virtual Memory Notice: The slides for this lecture have been largely based on those accompanying the textbook. 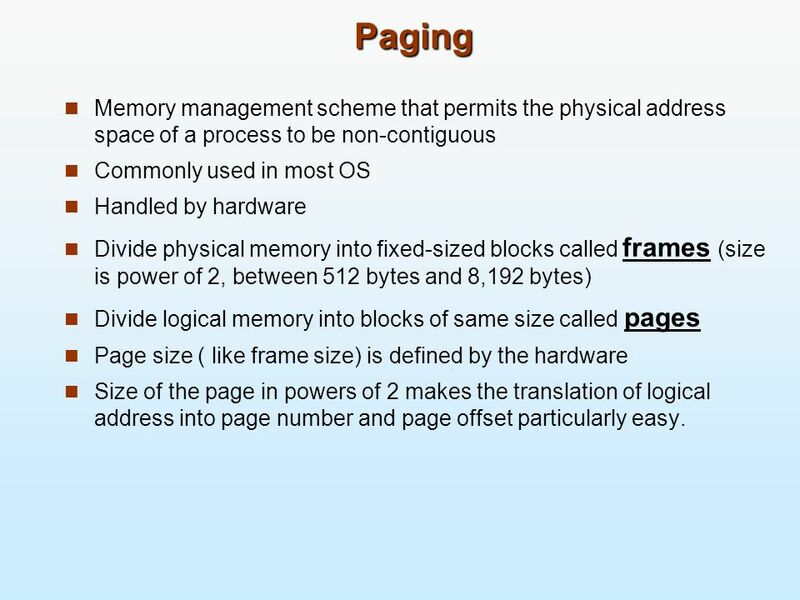 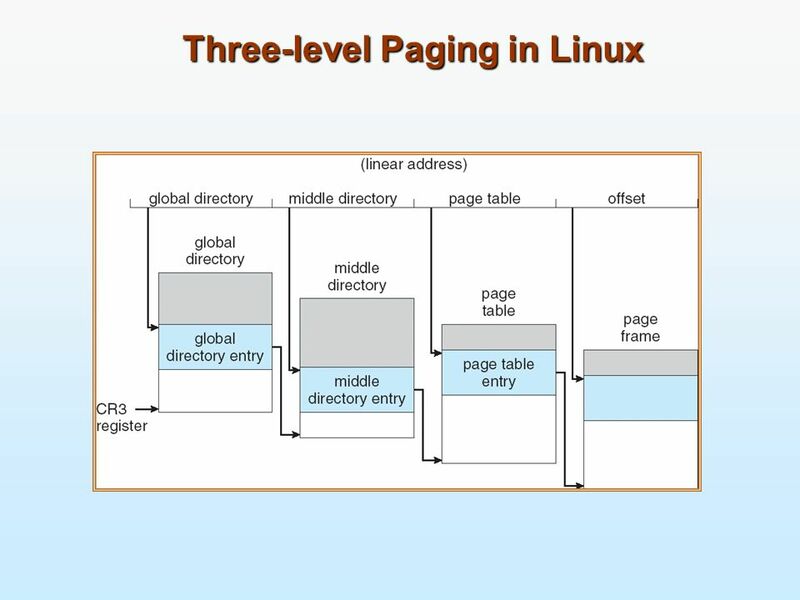 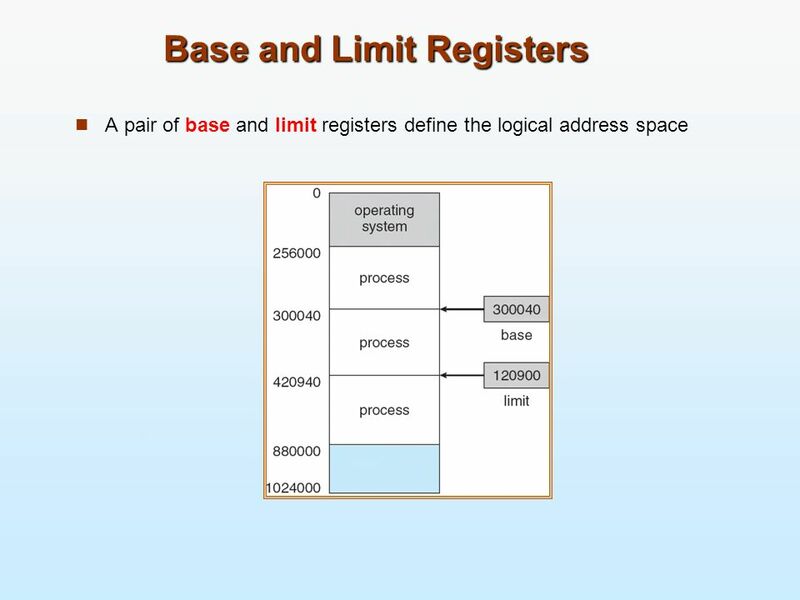 03/05/2008CSCI 315 Operating Systems Design1 Memory Management Notice: The slides for this lecture have been largely based on those accompanying the textbook. 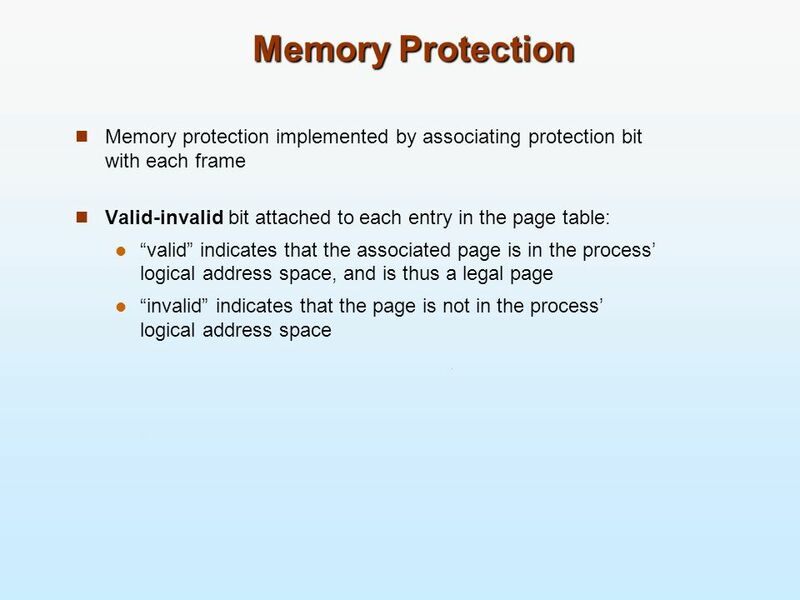 Chapter 8: Main Memory. 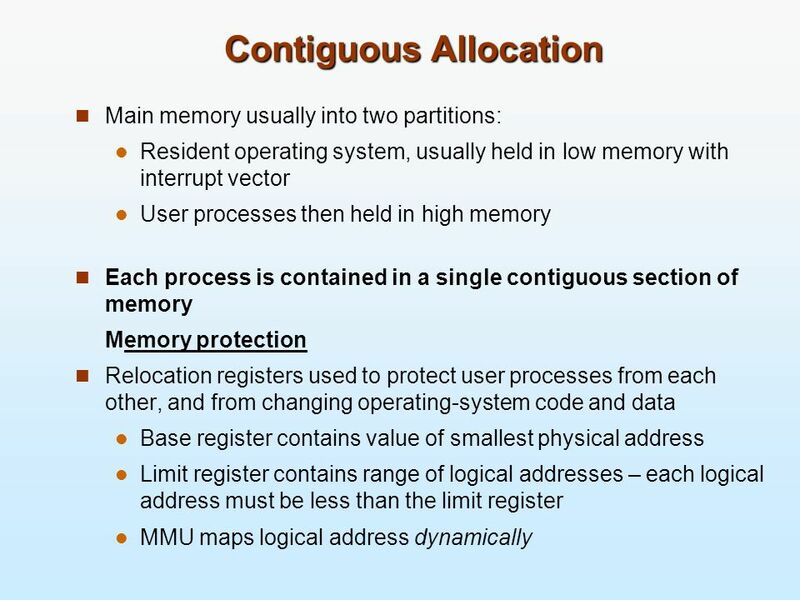 8.2 Silberschatz, Galvin and Gagne ©2005 Operating System Concepts – 7 th Edition, Feb 22, 2005 Chapter 8: Memory Management Background. 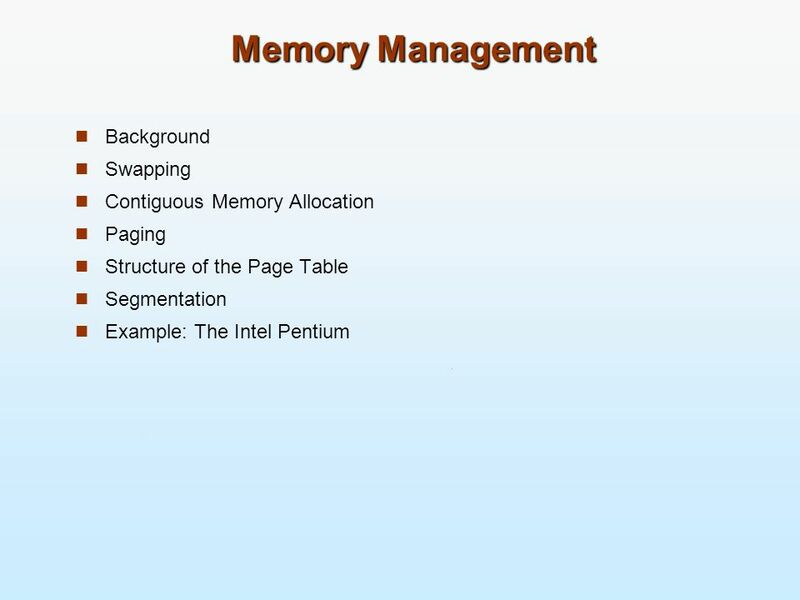 Chapter 8: Memory-Management Strategies. 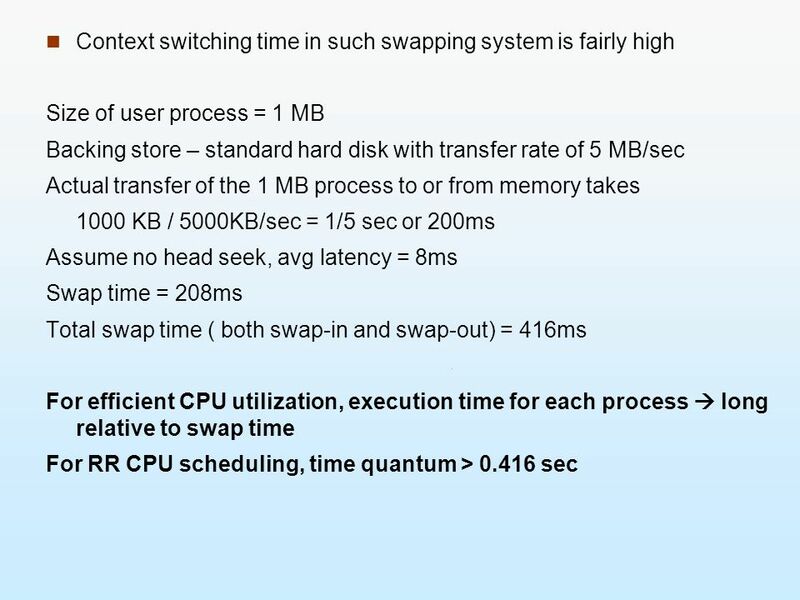 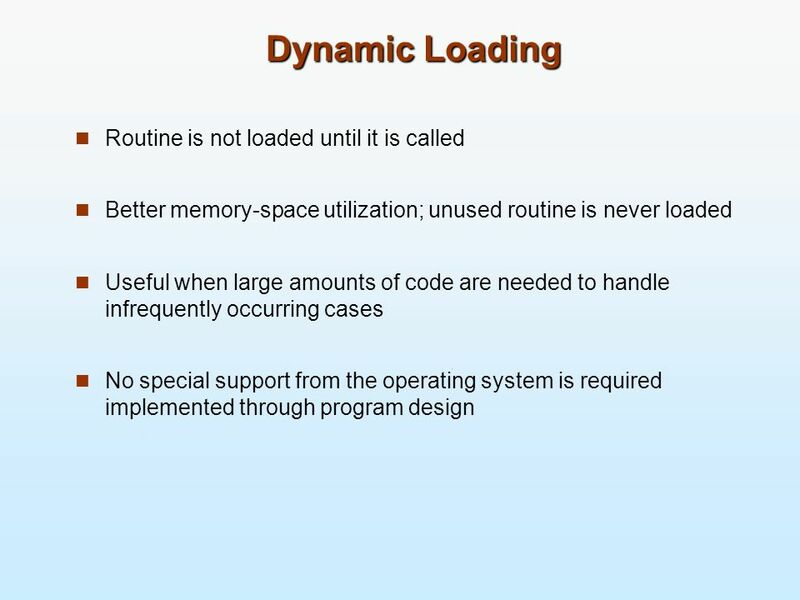 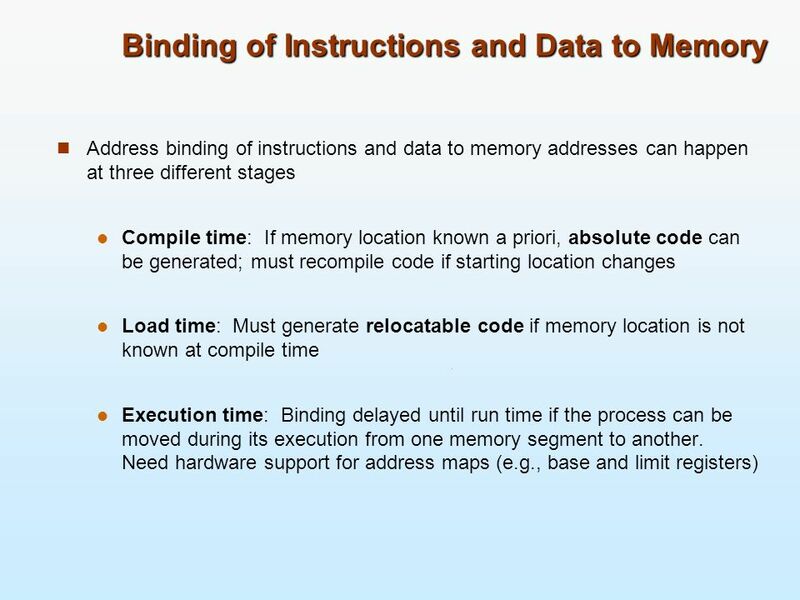 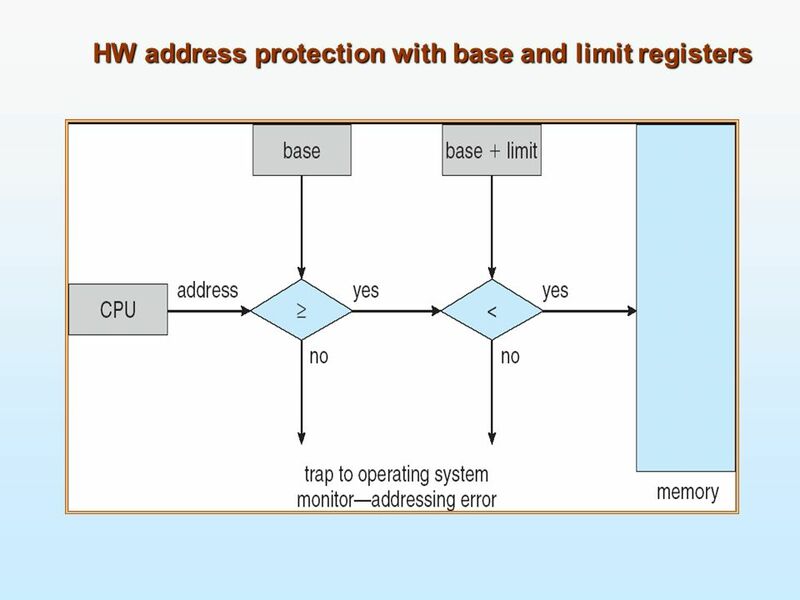 8.2Operating System Principles Chapter 8: Memory-Management Strategies Background Swapping Contiguous Memory.